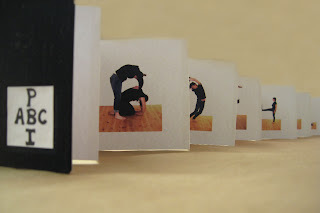 The contortions that comprise PBI ABC were conceived and practiced in a public park on the banks of the Kalamazoo River in Saugatuck, MI by four artists fortuitously brought together by the Paper and Book Intensive. We hope that this abecedary conveys whimsy and the uncanny – bodies balanced on the edge of language. 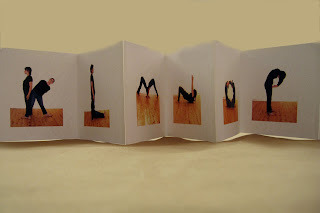 Arini Esarey is a book artist and student in the bookbinding program at North Bennet Street School in Boston, Massachusetts. Amy LeePard is a book artist and letterpress printer in Northport, Alabama whose work focuses on the stories and experiences of everyday people. Benjamin Reynaert is an artist in Ann Arbor, Michigan whose work creates places that are built from commonly found paper products and transformed into sculptural book objects. Kalmia Strong is an artist who is studying to be a librarian/book historian/ conservator. 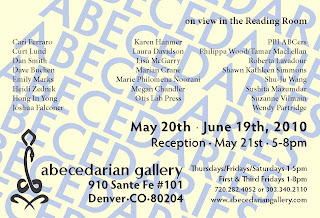 PBI ABC will be on display at The Abecedarian Gallery in Denver, Colorado during the exhibition ABECEDARIES.